Roverway 2018: Opposites Attract takes place from 23 July to 2 August 2018. 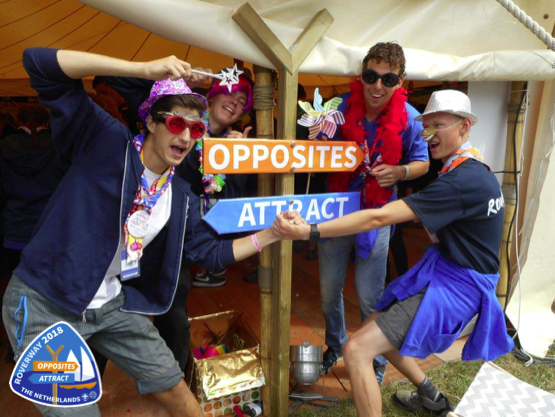 Scouting Nederland, the European Scout Region of WOSM and the Europe Region WAGGGS welcome all European Rovers and Rangers (Scouts and Guides aged 16-22) for an adventure of a lifetime in the Netherlands. It is now time to check whether your National Scout Organisation has registered its contigent and nominated its Head of Contigent (HoC)! At Roverway 2018, Rovers and Rangers will be challenged to explore unknown paths and uncharted water, to discover different cultures and to interchange experiences, knowledge and ideas. – and Career.Through Roverway, Rovers and Rangers are given the opportunity to share their experiences and be an active citizen within their own community. International Service Staff (IST) will receive a training course on the Rover/Ranger programme and Roverway. Scouts and Guides will be challenges to develop a constructive and critical mind-set about their role in society and to approach others in open and honest debate. The host team of Scouting Nederland and the planning teams of the European regions of WOSM and WAGGGS look forward to receiving many registrations and welcoming Heads of Contigents for their first meeting in the Netherlands in March.